REGINA, Aug. 15, 2017 /CNW/ - Input Capital Corp. ("Input" or the "Company") (TSX Venture: INP) (US: INPCF) has released its results for the third quarter of its 2017 fiscal year. All figures are presented in Canadian dollars. "The biggest development at Input so far this year is the introduction of Marketing Streams," said President & CEO Doug Emsley. "In combination with our recently-received Canadian Grain Commission grain dealer licence, we are incredibly enthused about Marketing Streams because they represent an opportunity to make all 50,000 canola farmers in Canada into clients of Input. Not every farmer needs a Capital Stream, but every farmer wants to sell their canola for more money, and that's what Marketing Streams offer. The addressable market for Marketing Streams is at least five times larger than the addressable market for Capital Streams, and this is made obvious by the fact that Input was able to sign up 190 Marketing Streams in just the first half of the calendar year. That's more Marketing Streams in the first six months than Capital Streams over the past five years. "Marketing Streams require less capital, have higher returns with less risk to Input, and help every farmer improve their bottom line. Most of the Marketing Streams completed so far are quite small, but this is by design. Our "Land and Expand" strategy allows farmers to try a small Marketing Stream to experience the benefits of Marketing Streams before deciding to make a larger commitment of canola into Input's canola marketing program. As a result, in the short term, these early Marketing Streams represent significant low-hanging fruit for fresh capital deployment opportunities this winter. In the longer term, Marketing Streams offer an opportunity to aggregate very significant canola volumes via multi-year contracts. This turns Input into a strategic player in the Western Canadian canola market, the top canola production and exporting region in the world." 1 Non-IFRS financial measures with no standardized meaning under IFRS. For further information and a detailed reconciliation, refer to "Non-IFRS Measures" beginning on page 24 of the MD&A. Recorded gross capital deployment of $35.063 million in upfront payments into 191 streaming contracts, adding 124 new producers to the portfolio and more than 279,000 MT to the Company's future canola sales. *Upfront payment per tonne reflects upfront payments made into both Capital Streams and Marketing Streams. For more information about Marketing Streams, refer to discussion on Marketing Streams beginning on page 11 of the accompanying MD&A. For the quarter ended June 30, 2017, Input generated adjusted sales from streaming contracts of $1.268 million on adjusted streaming volume of 2,536 MT for an average price of $500 per MT. The sales from streaming tonnes plus net settlements of canola interests for the quarter represent a significant increase in quarterly volume over the comparable quarter one year ago, when the Company sold 250 MT of canola equivalent for revenue of $0.115 million for an average price of $460 per MT. For the nine months ended June 30, 2017, Input generated adjusted sales from streaming contracts of $22.086 million on the adjusted streaming volume of 46,486 MT an average price of $475 per MT. The sales from streaming tonnes plus net settlements from streaming tonnes for the nine months ended June 30, 2017, represent a 20% increase in quarterly volume over the comparable period one year ago, when the Company sold 38,033 MT of canola equivalent for revenue of $18.388 million for an average price of $483 per MT. When sales of crop grown in 2016 but sold before the beginning of the current fiscal year are included, Input has generated adjusted sales from streaming contracts of $29.742 million on adjusted streaming volume of 62,402 MT at an average price of $477 per MT. During the quarter, Input added 124 new producers to its streaming contract portfolio; 89 in Saskatchewan, 33 in Alberta and 2 in Manitoba. The remaining contracts were renewals, expansions and restructures of existing contracts. During the comparable quarter last year, Input added 13 new producers to its portfolio. Input has taken deliberate steps to add a larger number of smaller contracts to its portfolio of streaming contracts, including Capital Streams and Marketing Streams, and is pleased to have added a record number of new producers to its portfolio in consecutive quarters. During the quarter, Input's average upfront payment per tonne was $138.05 compared to $269.57 in the comparable quarter last year. The upfront payment per tonne reflects upfront payments made into Marketing Streams, which are lower than upfront payments into Capital Streams, bringing the upfront payment per tonne down substantially over the past six months. As a result, Input now controls more physical canola per dollar invested than at any time in its history. For more information about Marketing Streams, refer to discussion on Marketing Streams beginning on page 11 of the MD&A. For the nine months ended June 30, 2017, Input recorded gross capital deployment of $35.063 million (compared to $24.041 million in the same period last year) into 191 streaming contracts for the right to purchase more than 279,000 MT of canola over the life of the streaming contracts. Net deployment for accounting purposes was $30.756 million. During the nine months, Input added 191 new contracts; 136 in Saskatchewan, 52 in Alberta and 3 in Manitoba. The remaining contracts were renewals, expansions and of existing contracts. During the comparable nine month period ended June 30, 2016, Input added 28 new producers to its portfolio. During the nine month period, Input's average upfront payment per tonne was $110.07 compared to $292.25 in the comparable period last year. The upfront payment per tonne reflects upfront payments made into Marketing Streams which are lower than upfront payments into Capital Streams, bringing the upfront payment per tonne down substantially. As of June 30, 2017, Input's active streaming portfolio consisted of 300 geographically diversified streams. 220 of the Company's canola streams are with farms in Saskatchewan, 71 are located in Alberta, and 9 are in Manitoba. The Company is pleased with its continued growth across Alberta and Saskatchewan and expects to continue diversifying its asset base across the Prairies as it adds new streams to its portfolio. Management expects that Marketing Streams are more saleable than Capital Streams year-round, leading to greater activity in the summer months than previously experienced in other years. This is borne out by the number of Marketing Streams entered into in Q3, but is not likely to be the case in Q4. The 2017 harvest has begun in a few areas in western Canada, and the fact that farmers are busy in the field has always made Q4 the slowest period for capital deployment and interaction with farmers. Based on capital deployment for the fiscal year to date, the final total for FY2017 is more likely to end up around $40 million than the Company's original $50 million goal. However, due to differences in rates of return on Marketing Streams vs. Capital Streams, this will have a smaller impact in FY2018 than if all of the deployment had been into Capital Streams alone. This is also the time of year when Input is busy putting the finishing touches on its canola sales program. Canola prices have been strong due to concerns about the soybean crop in the US and reports of dryness in some areas of the Canadian Prairies, focussed on southwest Saskatchewan. Management does not anticipate any material impact on its anticipated canola sales as a result of drought in this area. Generally, the affected area is an area of lower canola production due to climate and soil conditions, so Input has less portfolio exposure in the area than it does in the heart of canola production, where crop conditions are reported to be good. The greatest uncertainty for Input at this time of year is the timing of pending harvest canola deliveries – it is impossible to predict how much crop will be able to be delivered in September, and thus contribute to FY2017 financial results. If deliveries in September are high, this will drive financial results for FY2017 higher. If deliveries in September are low, the deliveries and financial benefit will occur in FY2018 instead. This will be a question every year, making it difficult for management and shareholders alike to predict final outcomes for the current fiscal year in advance. It is recommended that participants dial in five minutes prior to the commencement of the conference call. 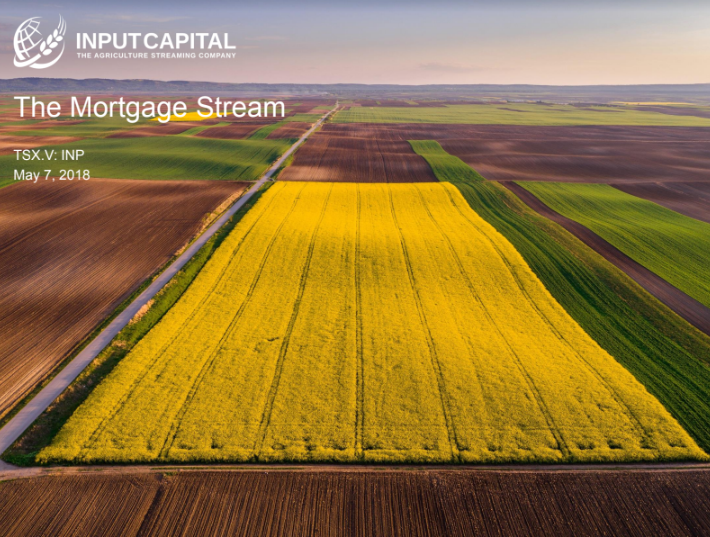 Soon after the completion of the call, the webcast will be available for download on the Input Capital website at investor.inputcapital.com. Input is a grain dealer licensed and bonded by the Canadian Grain Commission. Input buys canola from western Canadian farmers via multi-year streaming contracts. Under a streaming contract, Input purchases a fixed portion of the canola produced by a farmer, at pre-negotiated prices, for the duration of the term of the contract. Input is a non-operating farming company with a diversified portfolio of canola streams, all of which produce canola and revenue for Input within a year of being signed. Input plans to aggregate canola from large numbers of farmers to grow and diversify its low cost canola production profile. Input is focused on farmers with quality production profiles, excellent upside yield potential, and strong management teams.